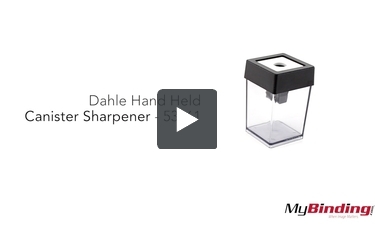 This is the Dahle Hand Held Canister Sharpener - 53461! The top of it is gray! And insert your wood pencil and start twisting; all the shavings get trapped in the canister and not all over the place! Now you have a nicely sharpened pencil! Easily pop off the top—preferably over a trash can—and empty our the trimmings when it’s full. The metal sharpener is attached to the top, and here’s just a nice look at it in action. Here is a comparison to Dahle’s other very similar canister sharpener.